This baked dish is healthy and tasty and is really satisfying. If you have pork loins at home, this is a handy recipe to try. The recipe combines pork loins, stock, and vegetables for a superb taste that goes beyond lunch or dinner. 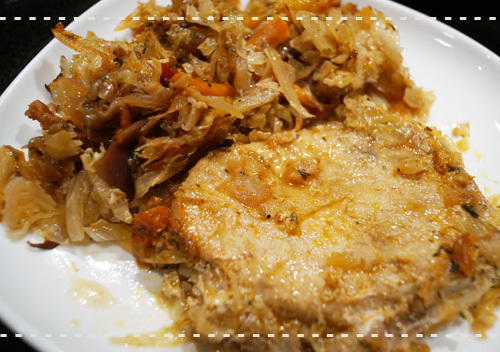 Delicious and loaded with flavor, pork loins with cabbage make a filling, mouth-watering comfort food. Your friends and family will be surely asking for this recipe. The fragrance and taste is truly unforgettable and the ingredients blend well in a meal you will be so proud to serve. Combine the cabbage, carrots, onions and garlic in a bowl. In a large roasting pan place a layer of shredded cabbage mix (about half) then arrange the pork loins and place the rest of the cabbage mix on top. Add olive/coconut oil, seasoning and stock. Cover and bake for 1 1/2 hours on 375 F.
Remove the lid and add the canned tomatoes. With a wooden spoon mix the tomatoes with the cabbage and bake for another 15-20 minutes. *You can use 2 packages (800g) coleslaw instead of the cabbage and carrots.